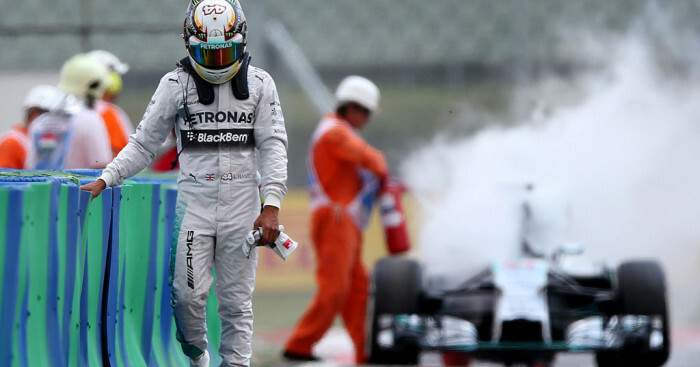 Lewis Hamilton knows he is in for a tough Sunday in Hungary as he is starting at the back of the field after his W05 caught fire in qualifying. Hamilton failed to set a time in Saturday’s qualifying at the Hungororing as, for the second week in a row, he was hit by car troubles. This time a suspected fuel leak resulted in a fire engulfing the back of his W05 as he put in his first lap in Q1. Pulling over at the entrance to pitlane, Hamilton was initially unable to stop his car meaning there was even more fire damage. He finished the afternoon P21 but will drop to the very back of the grid as his stricken car needs a new gearbox. He told BBC 5 live: “We’ll have to replace the engine and gearbox, but with that penalty it’s a good thing – I can’t go any further back [on the grid]. “There’s a lot going through my mind, but I just have to try to turn it into positives until tomorrow. The British racer, who had set the pace in all three practice sessions, concedes he is in for a difficult Sunday afternoon as it is not easy to overtake at the Hungaroring. Hamilton, a four-time Hungarian GP winner, heads into Sunday’s 70-lap race trailing his team-mate Nico Rosberg by 14 points in the Drivers’ standings.